PowerROC T25 DC helps Moroccan drilling firm win new major assignment. 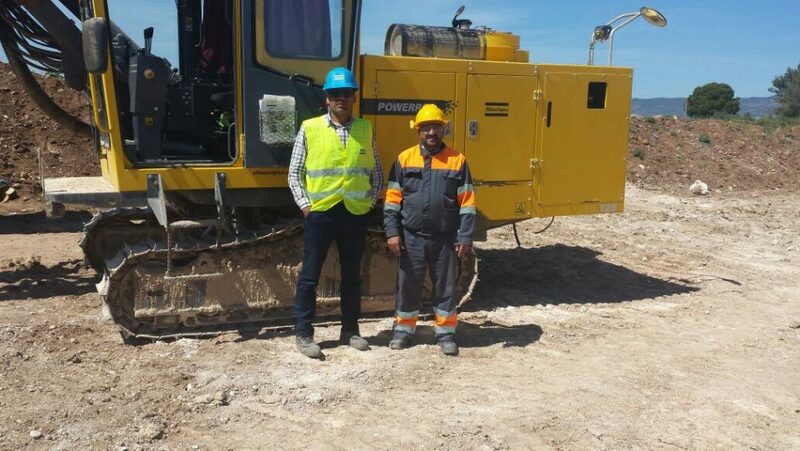 Somatrin Group, a leading Moroccan contractor working the quarries and open pit mines of Morocco, has recently been awarded a new contract after choosing drilling equipment from Atlas Copco. The contract, which is for five-years, involves drilling at the LaFarage Meknès limestone quarry in the center of the country where Somatrin has decided to deploy the robust PowerROC T25 DC. At the Lafarge Meknès quarry site where rock conditions range from soft-to-medium and very soft formations, the company is contracted to produce approximately 1 million tonnes of limestone per year. Drilling 89 mm holes in the soft-to-medium hard areas, the PowerROC T25 DC achieves an average penetration rate of 25 meters per hour and approximately 20 m/h in the very soft areas. The rig works on benches 6–10 m high using a drilling pattern of 2.5 x 3 m.
Previously at this site, the company had used a ROC F6 equipped with a Down-the-Hole STD35 hammer to drill 90 mm holes. The penetration in the soft-to-medium hard areas was 30 m/h but only 18 m/h in the very soft areas. Jamming also occurred in these softer areas causing production delays. Comparing the two machines, Quarry Supervisor Baqqas Mbarek says the PowerROC T25 DC is “by far the most advantageous”. He says this is mainly due the rig’s high penetration rate, ease of maintenance and low fuel consumption, which is almost half that of the ROC F6. PowerROC T25 DC product page.